Off the Clock offers a unique glimpse at the work of twelve artists who share a common thread in their dedication to teaching art to students in Belmont schools. The work of these teaching artists includes a variety of media including oils, acrylics, ceramics, fiber, printmaking, photography, sculpture and collage. 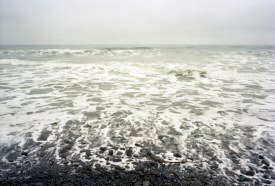 Initially conceived of by artist/teacher Nicole Pond, she sees the Off the Clock exhibit as an opportunity for people in the community to see what art teachers are creating as individual artists. When Pond, working with Belmont Gallery of Art administrator Nan Rogers, approached other local teachers about participating in the show, they were met with an enthusiastic response. 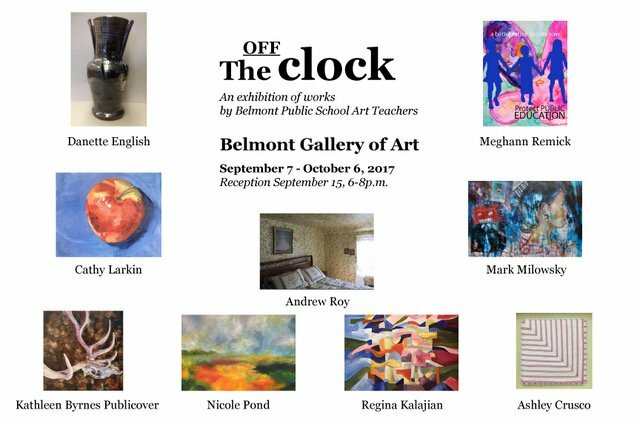 Off The Clock includes artists from the Belmont Public Schools; Kathleen Byrnes, Danette English, Nicole Pond, Regina Kalajian, Katharine Kelley, Adrienne Landry, Mark Milowsky, Kristen Ripley, Andrew Roy, and Shirley Huller White. 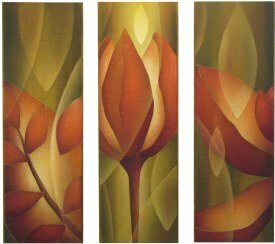 Also showing from Belmont Day School, are artists Anne Armstrong and Kathy Jo Solomon. Here’s an opportunity for gallery visitors to see the work these teachers have created when they’re away from school and working Off The Clock in their medium of choice. Off the Clock runs through September 26 with an artist’s reception on Friday, September 19.